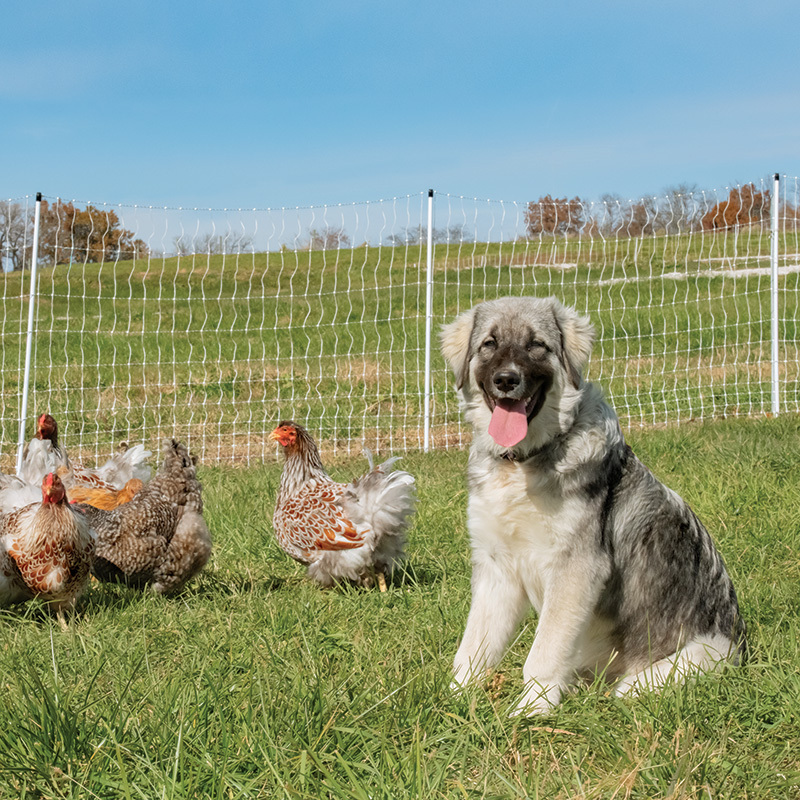 A 42" tall portable electric fence used to keeps in chickens, ducks, geese and other poultry while keeping their ground-based predators out. Recommended for containing heavy, non-flying birds. 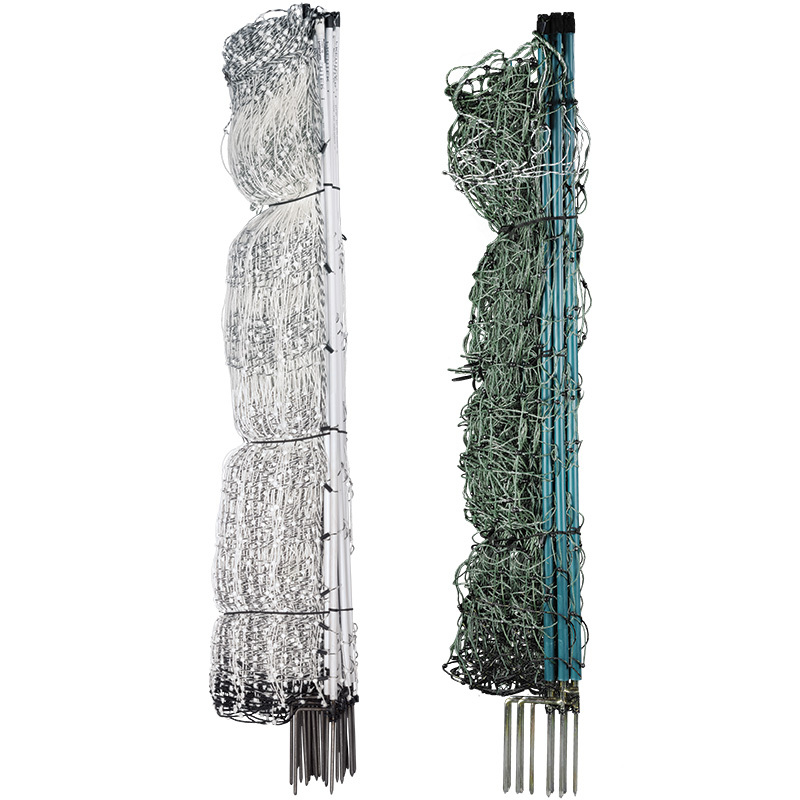 For fences that involve curves, corners and directional change, or when aesthetics are a concern, “Plus” nets include additional line posts to reduce sag. 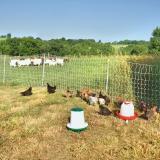 Line posts are spaced every 6'8" (vs. 12' for standard 42" PoultryNet). Each roll is a complete fence with the posts already built into the mesh/fence. One roll (100 ft) weighs only 21 lbs. You will need a fence energizer to electrify the net. 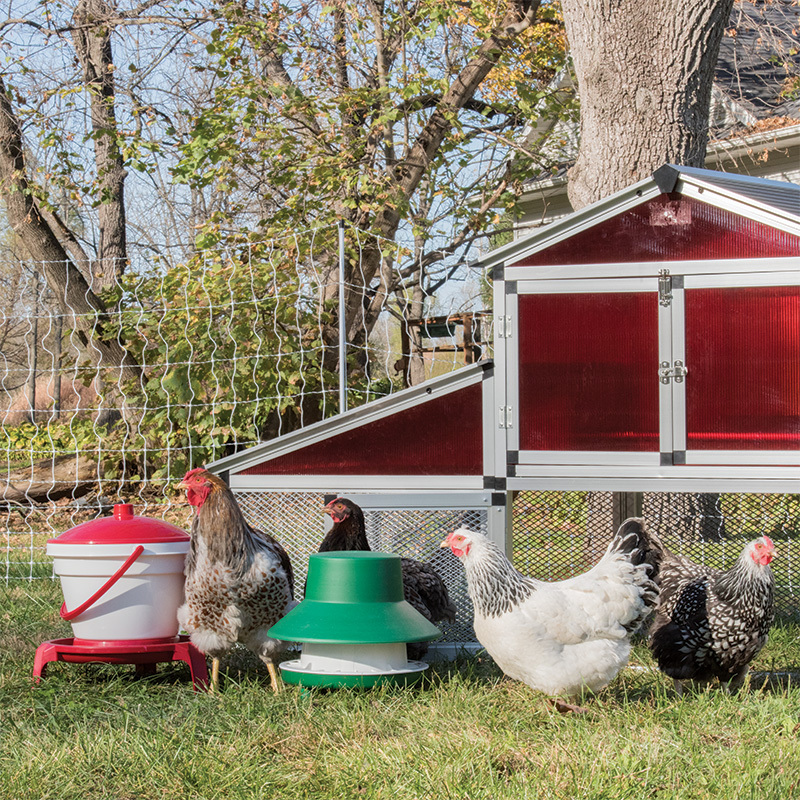 Which PoultryNet® is right for you? 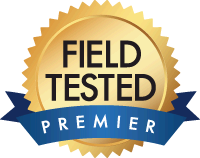 We offer many fences to fit your situation, including complete kits, different heights and lengths, multiple colors, drivable posts and positive/negative options for dry soils. 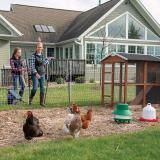 Visit this link to compare all PoultryNet options. Netting is quick and simple to move. 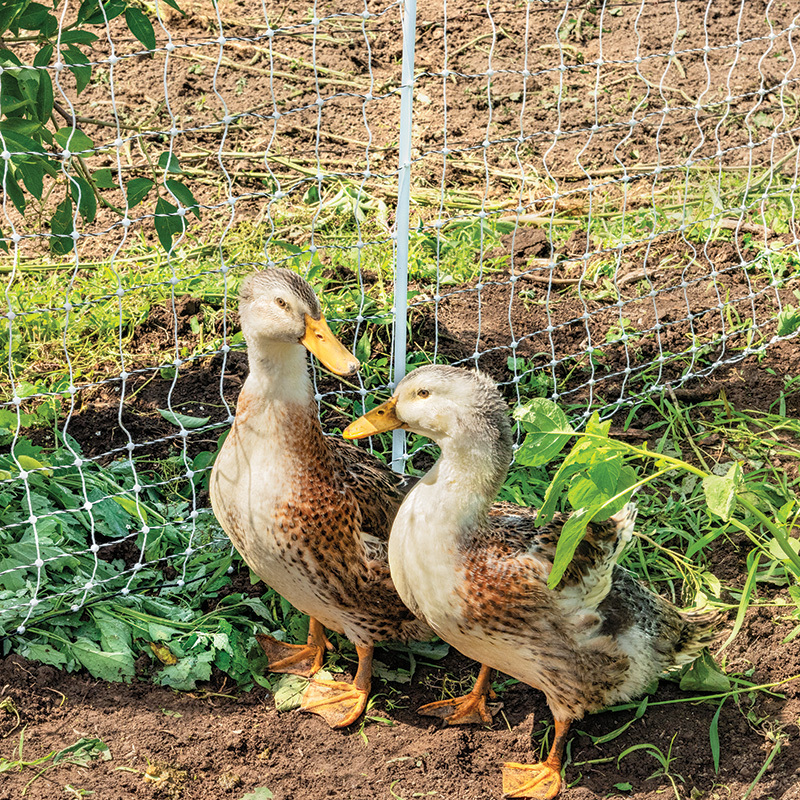 Even for new users, it takes less than 10 minutes to go from out-of-the-box netting to installed fence. No extra gates needed. Just turn off the energizer and pull the first post to create an opening. 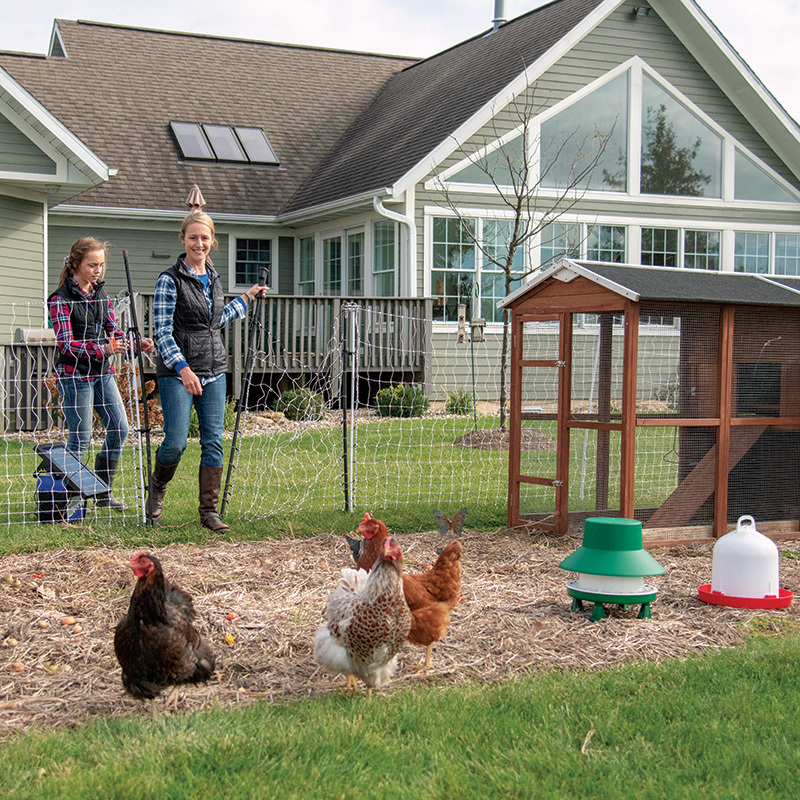 For added convenience, a PoultryNet® Gate can be used to provide easy access without the need to turn the energizer off. 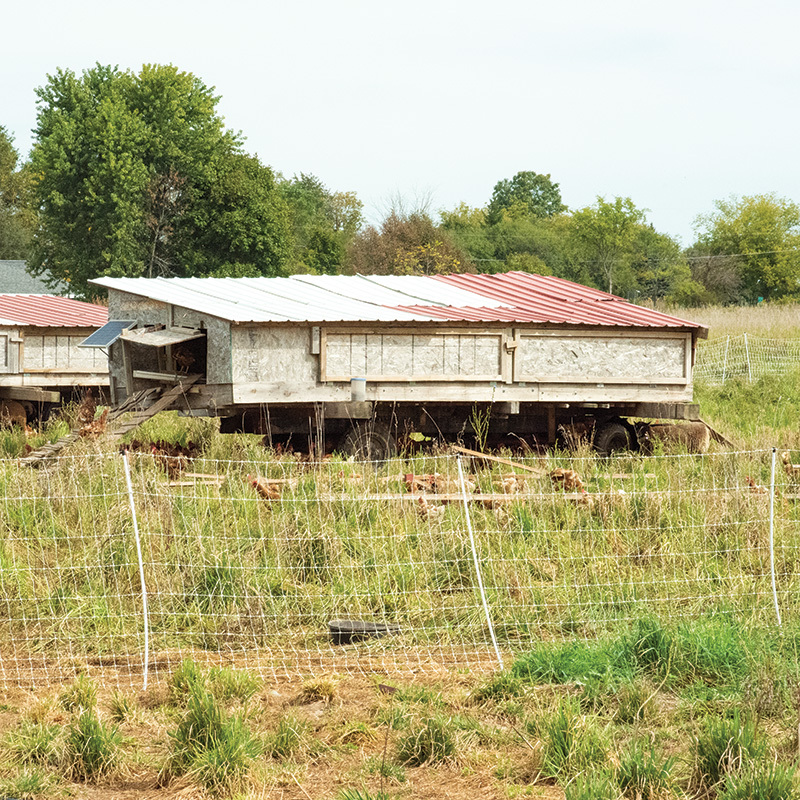 PoultryNet® Plus 12/42/3 is identical to standard 42" PoultryNet, but to help with sagging, we’ve added more posts to shorten the distance between them (6'8" vs. 12'). More posts means less sag and a more versatile fence which adapts easily to curves and hills. 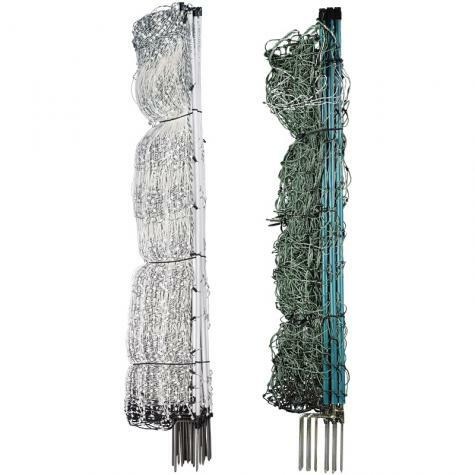 Double spike posts are more stable in soft soils. Green is available for those who prefer to have the fence blend into the background or landscape. Prevent raccoons, coyotes, foxes, dogs and other predators from killing poultry. 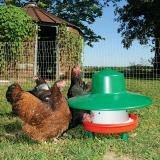 Can be used to contain and control livestock other than poultry, such as goats. Vertical Strands Plastic strings, spaced every 3"
Horizontal Spacings 2", 2", 2", 2", 4", 4", 4", 4", 4", 6", 8"
Netting must be moved when tall grass covers the lower “hot” strands. The alternative? 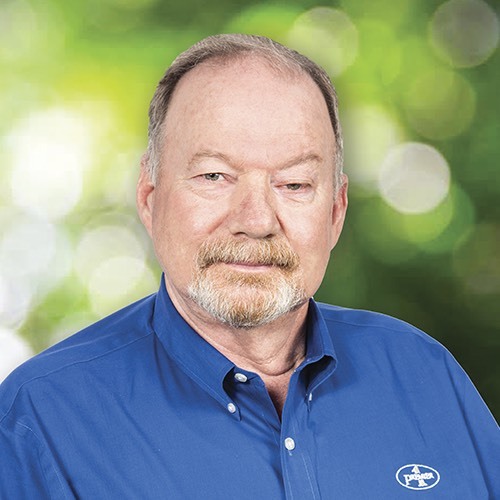 Apply a strip of herbicide to kill vegetation. 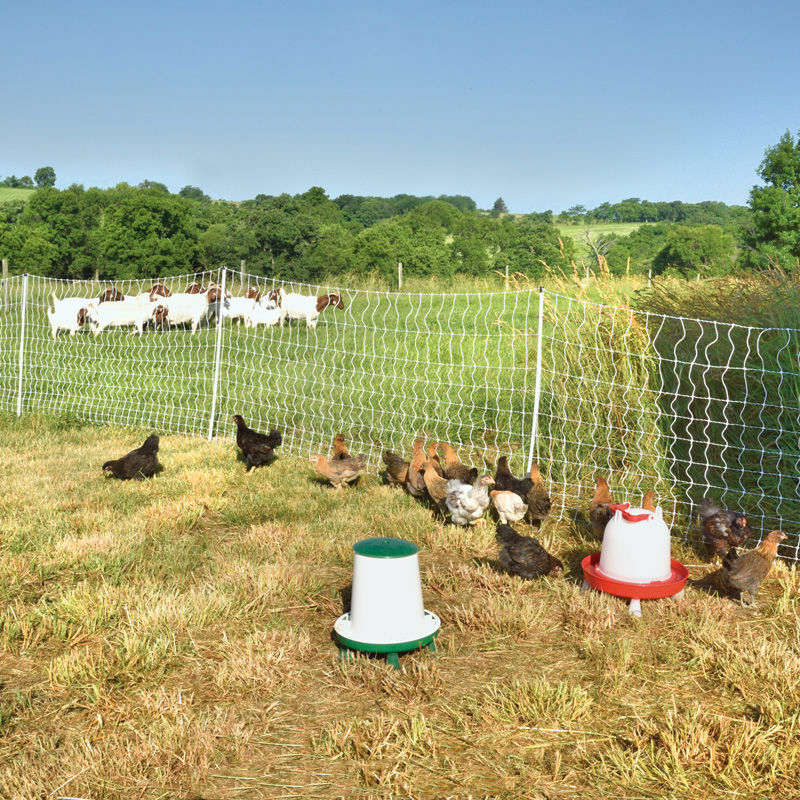 With PoultryNet, the bottom hot wire can slip off of the plastic portion of the end posts onto the metal spikes. This will cause a dead short and no energy will be on the fence. Unhook the energizer and slide the hot wire back onto the post. Reconnect the energizer to the net and test. 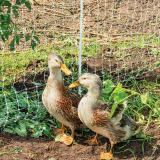 With proper care, electric netting should last 5-7 years. Replacements will be prorated. 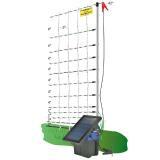 Provides easy access in/out of netting enclosures without the need to turn off the fence energizer. 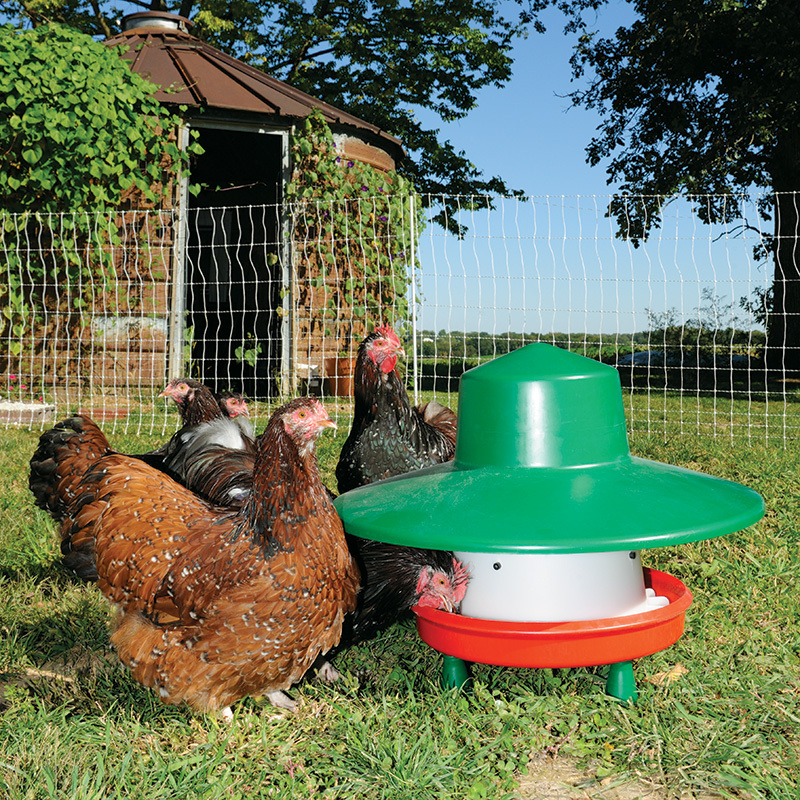 Same electrified mesh as 48" tall PoultryNet®. Clip designed for the spikes on standard netting posts. Keeps bottom black strand from sliding up and creating a gap at the bottom of the net. Replaces lost, misplaced or broken plastic caps (for posts 0.575" in diameter) on netting posts. Holds top strand of net in place so there is less sagging. Number of reviews: 49 customers reviewed this product. Recommended: 48 out of 49 said they would recommend this product to a friend. 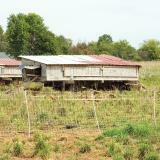 Some users dislike the tendency of standard PoultryNet to sag. 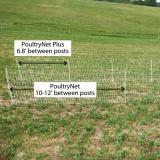 So we developed PoultryNet Plus with extra posts to reduce sag and enable the fence to better adapt to corners and curves. (FiberTuff support posts are still recommended at 90° corners.) When aesthetics are a concern, less sagging = more eye appeal. The extra posts make the net heavier to handle so we shortened the rolls to 50 ft and 100 ft lengths. Well made and durable. 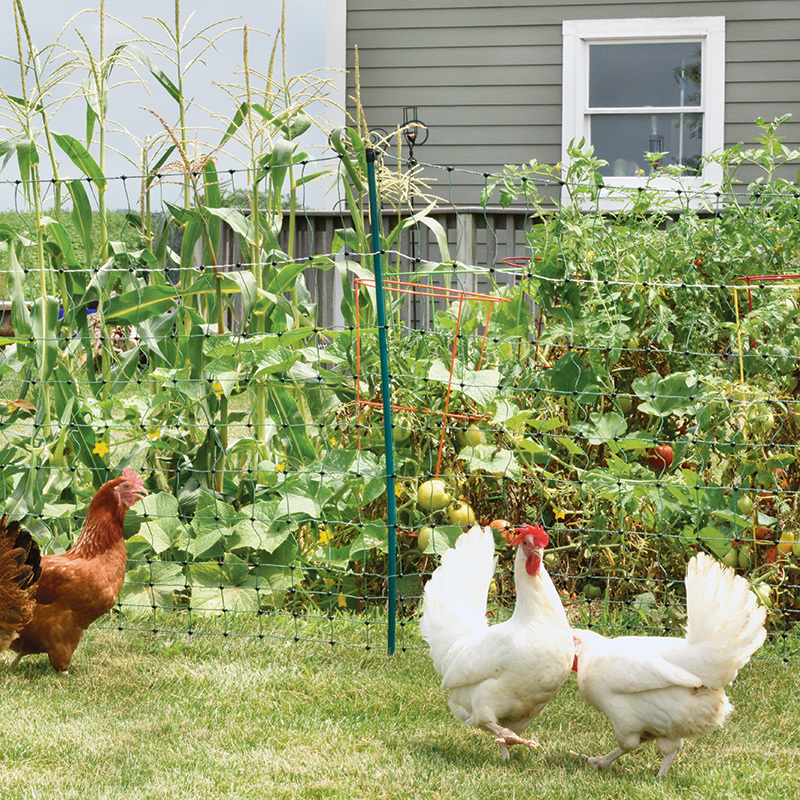 Keeps chickens and dogs. Easy set up and install. So far so good! I’ve been using the netting for about a week and a half, moving it every couple days around our small homestead. It works great for my goats and sheep, doesn’t get tangled like regular polywire, and really helps extend the grazing season. Purchased for protecting my backyard bird feeders from bears, raccoons and neighboring cats. My cat watched as I installed the fence. She checked every angle of the fence to see if there was a loop hole. As I watched her, she paced back and forth with ears slightly pinned downwards. Finally, her tail began to twitch. She made a rush at her calculated weak spot only to be dropped to the ground. Embarrassed, she left. I am very pleased with this product. 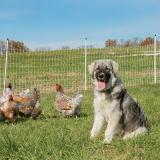 I was losing chickens to fox and dogs. Haven’t lost one since I put it up. Easy to set up and take down. I wish the ground spikes were longer, spikier and more heavy duty for hard clay soil (even though we’ve had a summer full of soaking rains and the ground is much softer than usual). Also, the top line seems to sag a bit. Finally, for a mixed flock, I don’t know how old/big the chicks need to be before it is “safe”. And is the concern that they fit through holes (in which case Momma hen calls them back) or that they are harmed by the electric current? I have left the fencer off when mom hen walks her chicks so they don’t get zapped... but then, of course, I need to babysit them. Not sure how many weeks old they need to be.